No matter what the next long-term disaster is, one thing is for certain: survival will be everyone’s primary objective. And unfortunately for most people, survival will be very difficult. The sad reality is that the vast majority of people are woefully unprepared for a long-term disaster. And one of the main reasons for that is they don’t even know what a long-term disaster would look like. Most people spend their time worrying about little things: what to eat, car troubles, the latest football game, etc. But that will change fast when disaster strikes. When that happens, they’ll all be caught off guard. Even preppers who have been stockpiling supplies and learning about survival for years are likely to be caught off guard. But whether the next crisis catches us by surprise or not, ultimately it will be those who didn’t prepare who are most vulnerable. The purpose of this article is to paint a basic yet haunting picture of what a long-term disaster will look like. My hope is that it will encourage you to start preparing if you haven’t already. 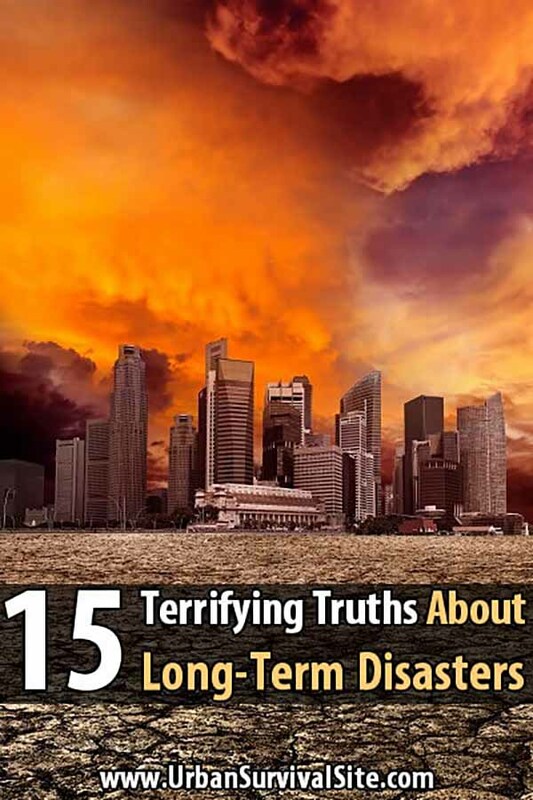 Here, then, are 15 terrifying truths about long-term disasters. The power grid that over 99% of the U.S. population is attached to is preciously fragile. It would only take a single major event, man-made or natural, to bring it down and throw the world into chaos. Here are some questions to ask before that happens. After Hurricane Katrina, National Guard forces and law enforcement units confiscated firearms from citizens. Depending on how organized and/or effective the government is during the disaster, this could easily happen again. All it takes is for martial law to be declared and you’ll be wishing some of your gun purchases weren’t recorded. At least as we know it. Many people will still barter and trade with one another during a long-term disaster, but the primary forms of business that we’re all used to will cease to exist due to supply chain interruptions. Supply chains, transportation, communications, roads, sewage, electric and other utility services, you name it. If the disaster is serious enough, don’t expect to enjoy these luxuries anymore. I’m talking about public workplaces, schools, libraries, parks, civic centers, and so forth. We tend to take these places for granted, and when they shut down it will have a dramatic effect on how the world operates. For those of us who regularly withdraw money from ATM machines, we won’t have that luxury to rely on either. That’s why you should set aside some cash in your home, assuming it won’t be worthless due to hyperinflation (which is why it’s also a good idea to have some precious metals). Grocery stores, gas stations, restaurants, and anywhere else that sells food will be looted until the shelves are stripped clean. It will only be a matter of days, or hours, before this happens. In addition, millions of people will be patrolling the forests and outdoor areas for game and stripping them clean of deer, elk, turkey, and other animals, so don’t count on being able to hunt for food. Instead, stockpile food! Once the water towers are empty, the tap water will stop running. At that point, you’ll need to find a way to purify any water that you find. Those who don’t will get sick from drinking contaminated water, and many will die. This is why you need to stockpile water filters in addition to water. Without running water, sanitation will become more important and more difficult. The streets will be dirty and garbage will be everywhere. Sanitation products such as hand sanitizer, shampoo, and soap will become trading commodities that can only be used sparingly. Unless you want to die from a disease or infection, you’ll need to stay as clean as possible. At least not in large numbers. Some law enforcement units will remain on duty, but if the disaster is serious enough, a strong majority of police officers will choose to stay home and protect their own families (and can you blame them?). Even if there are police nearby, you probably won’t be able to call them anyway. It’s hard to imagine a world without cell phones or the Internet, but once the power grid is down and the generators stop running, cell services and Internet connections will be down, too. Because of this, you’ll need some backup methods of communication. Desperate times means desperate people, and there will no one but yourself and possibly your community to protect you from them. That’s why home security and self defense skills are so important. Even the most moral people will turn into dangerous looters if they’re hungry enough, and it will be up to you keep them at bay. Today we’re used to the federal or state governments sending help and allocating resources in a disaster. But if the disaster is nationwide, it will be up to individual communities to handle these problems. In other words, you probably won’t have federal or state assistance to fall back on, so your next best bet will be your neighborhood or community coming together to solve problems. If the disaster forces you to bug out, do it fast because before long, the roads and parks will be jam packed with people and vehicles trying to escape the cities. Not only will those people be stuck on the roads and vulnerable, they will make traveling a nightmare if not impossible for everyone else. I don’t normally post doom and gloom articles like this, but every now and then it’s a good idea to remind ourselves what we’re preparing for. All the things I mentioned above have happened before and could happen again. Don’t be caught unprepared if they do. Good article, and I think you’ve hit the major points very well. One issue I would take is with your #2 item regarding martial law and the confiscation of firearms. Your premise depends upon a functioning government, whether at the federal or state level. If all of the remaining 14 conditions are true, these levels of government and the basic rule of law will be effectively ended. The only reason that gun confiscation worked after Hurricane Katrina is because government still existed. In a true SHTF event of national or global scale, there will be no government to issue or have the ability to communicate a declaration of martial law, and there will be no resources capable of enforcing it. Under those conditions, every active duty member of the military will be on foot and looking for food, along side the other 99% of the population. What you will have instead is unrestrained looting and barbarism. Anyone that ignores the fact that there are 350 million legally owned firearms in the U.S. does so at his or her own peril. Yea, I think you’re right. I was trying to write something that covered several possible scenarios. That’s why I included the line, “Depending on how organized and/or effective the government is during the disaster.” But yea, unless it’s a local disaster, we probably won’t have to worry about gun confiscation. Thanks for your reply. Given the general predictions about food availability and limited (or no) access to fuel, local, state and federal law enforcement agencies and military units will be in the same boat with the rest of us. The 1st Armored Division, and any other U.S. Army unit, won’t be going anywhere. My guess is that, within a month after a SHTF event, every grunt will be trying to find a way to get home to protect their own family. Food stores on military bases use the same “just in time” logistic systems as the rest of the country. Within 24 hours of an event, the shelves at Fort Bragg will be just as empty as those in your local super market. No gas – no food. Scary. You would think military bases would be more prepared than the average grocery store. The country would be far better off if there were more preppers in government. Walmart deliveries arrive at night, go straight to the shelves, and keep nothing in stock like they used to do. If you can find copies, two must read books are Alas Babylon by Pat Frank and Lucifer’s Hammer. They are dated in some things but they tell you exactly what supplies you will need. The first book is from the Cold War era and the second is a Comet. I have an original dog-eared copy of Lucifer’s Hammer that I’ve read at least four times over the years. Apart from it being an excellent read, it is just about the best prepper handbook you will ever find. I think I am on my fourth copy of Alas Babylon and second copy of Lucifer’s Hammer. And I am about ready for a fifth copy of the first book. Another book is LIVING ON A FEW ACRES. It was put out by the US Printing office over 30 years ago. It tells you about how much in seeds you need for a self sustaining farm. But the best book you will not find. It is my g-g-g grandmother’s household book. It has recipes and household hints from the late 1700’s to the late 1940’s. Vilifying Christians may be another indicator of a coming collapse. We are the last real voice of dissent in a shrinking democracy. Have to disagree with the last one. Any well trained military person will tell you that movement is life. A nomadic lifestyle is the most likely to keep you alive. Don’t think of it like you are moving everyday…more like the Native American way of life…move where the food is for that season. Finding like minded people would be very beneficial and help prevent over harvesting. Is movement really life? How did that work out at Gettysburg when the Union had the high ground and defensive positions? Yawn. Sorry for the late reply I don’t use this account much…LMAO you may want to move in the correct directions and not make stupid decisions…I’m not referring to a battle plan, I am talking about evading, not resistance. Anyone who thinks they are going to try and resist the most powerful military on earth with their 12 gauge or AR15 or what ever they may have is delusional.